Pioneer Virginia gospel/pop quartet of the '30s and '40s. Calling their innovative approach to sacred hymns "jubilee" singing, the Golden Gate Quartet, propelled by Willie Johnson and William Langford, enjoyed massive acceptance far outside the church. Their smooth Mills Brothers-influenced harmonies made the Gates naturals for pop crossover success, and they began recording for Victor in 1937. National radio broadcasts and an appearance on John Hammond's 1938 "Spirituals to Swing" concert at Carnegie Hall made them coast-to-coast favorites. By 1941 the Gates were recording for Columbia minus Langford, and movie appearances were frequent: Star Spangled Rhythm, Hollywood Canteen, and Hit Parade of 1943, to name a few. Some experiments with R&B material didn't pan out during the late '40s, and Johnson defected to the Jubilaires in 1948. The group emigrated to France in 1959; led by veteran bass singer Orlando Wilson, the Golden Gate Quartet's vocal blend is as powerful as ever. 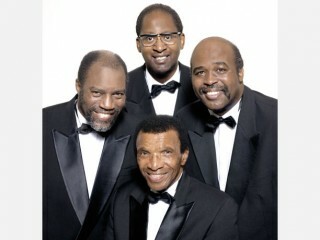 View the full website biography of Golden Gate Quartet.